Fax Voip Softphone - Fax Voip Softphone - SIP/H.323 software telephone. Call Recording. Playing audio messages into the telephone line. Sending and Receiving T.38 and Audio Faxes. Music on Hold. Call Transfer. Call Forwarding. Phone Book. Log Book. Random Phone Calls. Fax Voip Softphone is a powerful and unique SIP / H.323 software telephone that lets users make phone calls, record calls, play audio files into the telephone line as well as send/receive T.38 and audio faxes from one single software application using any Voice over IP (VoIP) telephony provider. Fax Voip Softphone supports Music on Hold, Call Transfer and Call Forwarding. Hairpin Call Transfer and Hairpin Call Forwarding (2 call legs). Audio and Fax panel allows you to send pre-prepared faxes and audio messages in one click. With Log Book you can easily view call history, view received and sent faxes and listen to call recordings and sent audio messages. The Phone Book provides a convenient place to store information about your contacts. Random Phone Calls function can be useful for your business, as well as for different testing purposes. The function allows you to automatically make repetitive phone calls to one or more target phone numbers. This function allows you to play audio messages into the telephone line, as well as to record phone calls. 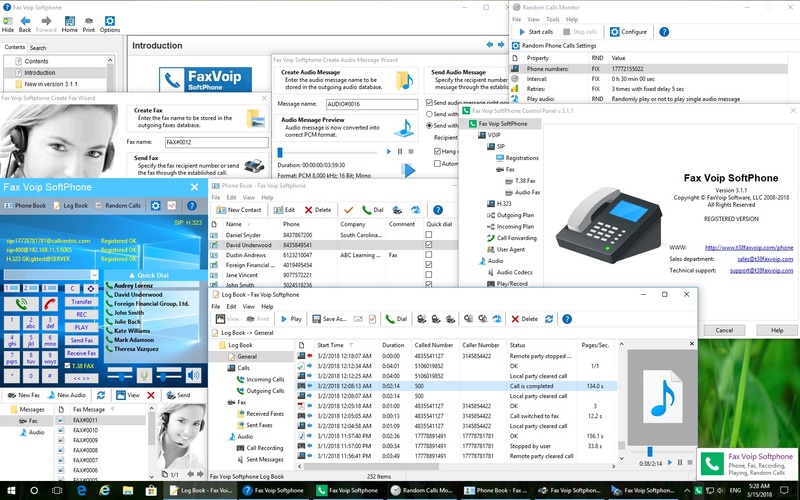 Using the Fax Voip Softphone Control Panel, you can easily configure the softphone according to your requirements. Fax Voip Softphone has been successfully tested with CALLCentric, babyTEL, T38FAX, MondoTalk and many other VoIP service providers. Change your voice over IP and PC to phone; change voice\'s gender and age to have fun in online voice chat; create different voices for dubbing; morph songs and voices in songs; record voice chat, phone conversation, Internet radio, and music from online sites; add audio and background; compare changed voice to another\'s voice for simulation purposes; compatible with most instant messengers, PC to phone clients, game servers, and media players. Fax Voip T38 Fax & Voice - Fax and Answering Machine for your SIP/H.323/ISDN CAPI 2.0 line. Voice Fax Modem for standard Fax & Voice software. Multiple SIP Registrations. Call Routing. Color faxes. T.38, audio and CAPI fax. Fax Voip Virtual Printer. Incoming Fax Routing: Route through E-mail, Store in Folder, Print. Fax-On-Demand. Fully-functional system for sending faxes via e-mail (Mail to Fax) and for receiving faxes to e-mail (Fax to Mail). Blasting Fax Server is a cost-effective and reliable high-volume Fax Broadcasting software, has the Web Management interface. It sends bulk Faxes via regular fax modems and also over T.38 fax relay or G.711 fax pass-through VoIP networks, fully scalable up to 512 lines. Blasting Fax server can handle millions of Recipients with no sweat. Bad Number and duplicate fax number removal included and 33.3kbps or Class 2.1 supported. JVoIP is a Java VoIP SDK for developers to easily build SIP client applications or add VoIP call capabilities into any Java application. The whole library consist of a single 1 MB .jar file implementing a full features SIP client including SIP and media, mute, hold, transfer, forward, conference), DTMF, IM and many others with a wide range if codec\'s included (G.711, G.729, GSM, iLBC, SPEEX, OPUS). VoIP Tunneling and encryption technology by SecureVoIP in order to enable making and receiving VoIP calls for users who are behind firewalls that block VoIP traffic, especially in countries like UAE, Oman and others with internet restrictions. IVM can be used for a wide range of solutions from a simple computer answering machine to running a sophisticated telephone interactive response system. Just run the install file and IVM will be ready to answer calls. ABTO Software\'s VoIP SIP SDK allows quick VoIP softphone app development. SIP softphone provides voice, video and IM communication, supports VPN and SRTP connection, and is compatible with most SIP servers.